Alphaproteobacteria is a class of Proteobacteria. Like all Proteobacteria, they are Gram-negative. The Alphaproteobacteria comprise most phototrophic genera, but also several genera metabolising C1-compounds (e.g., Methylobacterium spp. ), symbionts of plants (e.g., Rhizobium spp.) and animals, and a group of pathogens, the Rickettsiaceae. In addition, the precursors of the mitochondria of eukaryotic cells are thought to have originated from Rickettsia spp. (See endosymbiotic theory.). Because of their symbiotic properties, scientists often use Alphaproteobacteria of the genus Agrobacterium to transfer foreign DNA into plant genomes, and they also have many other biotechnological properties. Aerobic anoxygenic phototrophic bacteria are alphaproteobacteria, widely distributed marine plankton that may constitute over 10% of the open ocean microbial community. 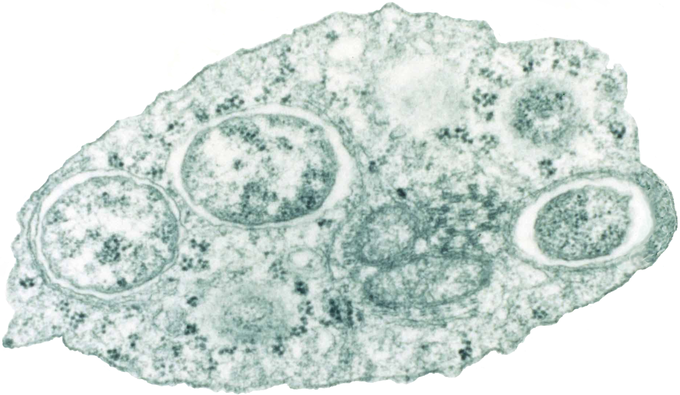 Alphaproteobacteria: Transmission electron micrograph of Wolbachia within an insect cell. The Class Alphaproteobacteria comprises ten orders (viz. Magnetococcales, Rhodobacterales, Rhodospirillales, Rickettsiales, Sphingomonadales, Caulobacterales, Kiloniellales, Kordiimonadales, Parvularculales and Sneathiellales). Comparative analyses of the sequenced genomes have also led to discovery of many conserved indels in widely distributed proteins and whole proteins (i.e. signature proteins) that are distinctive characteristics of either all Alphaproteobacteria, or their different main orders (viz. Rhizobiales, Rhodobacterales, Rhodospirillales, Rickettsiales, Sphingomonadales and Caulobacterales) and families (viz. Rickettsiaceae, Anaplasmataceae, Rhodospirillaceae, Acetobacteraceae, Bradyrhiozobiaceae, Brucellaceae and Bartonellaceae). These molecular signatures provide novel means for the circumscription of these taxonomic groups and for identification/assignment of new species into these groups. Phylogenetic analyses and conserved indels in large numbers of other proteins provide evidence that Alphaproteobacteria have branched off later than most other phyla and Classes of Bacteria with the exception of Betaproteobacteria and Gammaproteobacteria. The currently accepted taxonomy is based on the List of Prokaryotic names with Standing in Nomenclature (LPSN) and National Center for Biotechnology Information (NCBI) and the phylogeny is based on 16S rRNA-based LTP release 106 by ‘The All-Species Living Tree’ Project. The Alphaproteobacteria comprise most phototrophic genera, but also several genera metabolising C1-compounds (e.g., Methylobacterium spp. ), symbionts of plants (e.g., Rhizobium spp.) and animals, and a group of pathogens, the Rickettsiaceae. Scientists often use Alphaproteobacteria of the genus Agrobacterium to transfer foreign DNA into plant genomes. Alphaproteobacteria: Alphaproteobacteria is a class of Proteobacteria that are Gram-negative. phototroph: An organism that carries out photon capture to acquire energy. They use the energy from light to carry out various cellular metabolic processes. C1-compounds: chemical compounds containing only one carbon atom, for example, methanol.